Been feeling some regret lately and wanted to let it go. October was a tough month for me and really, September was only a little better. In those weeks, I had more bad days than good. Wrote 500 pages trying to understand myself and the emotional journey I found myself on, at age 59, when I’m supposed to be wise and know stuff and not have regrets because I know better than to do the things that I will regret. So not true. And regret was one thing that hid itself, sly fox. I was depressed, I was sad, I was confused, I was stressed. But regrets? Hadn’t thought about those. Until a chance remark made by another person made me think: wow, I have so many regrets. I’m hanging on to them and they are dragging me down. Once I finally copped to the situation, it was time to get to work on burning those regrets. Literally. Last night I wrote out about ten pages of regrets I had about hurting people, making bad choices, getting lost, you name it, I wrote it down. Something funny happened while I was writing. I started to realize that some of the things I regretted, in fact most of them, I would not change. Given the chance, I wouldn’t change much at all about my life and the way I’ve lived it. I learned so much by the mistakes I’ve made, I’m almost grateful for the suffering it brought. I do regret hurting others. I can take it; I’m tough. I just wish I didn’t mow innocent others down sometimes in my single-minded determination to do something, big or small, I will later come to regret. But the person hurt most by my actions, I discovered in writing, was myself. There was nobody else to blame, and really, I didn’t want to blame myself anymore, either. I had to change pens three times writing my little manifesto. Finally I wrote the last page in barely discernible ink. I didn’t want to get another pen. I was tired and my regret was fading just like the ink. Fitting and proper, I thought. So I went to bed, had a nightmare, woke up, and started a fire. I was careful, because I’ve done this particular cleansing ritual before, so I knew that a pot on the stove is not a good idea. Neither is a match on the sidewalk. But I wanted those pages good and burned and gone forever. And with them my regrets. So I balanced my pizza stone on the kitchen sink, water at the ready, and flicked my bic. I cannot tell you how satisfying it was to watch all that baggage go up in smoke. I won’t be looking back, I finally am unstuck, and I’m moving forward in a healthy way. Still, sorry to anyone singed along the way. Sincerely. Need to let something go? This works for more than regrets. It works for relationships. 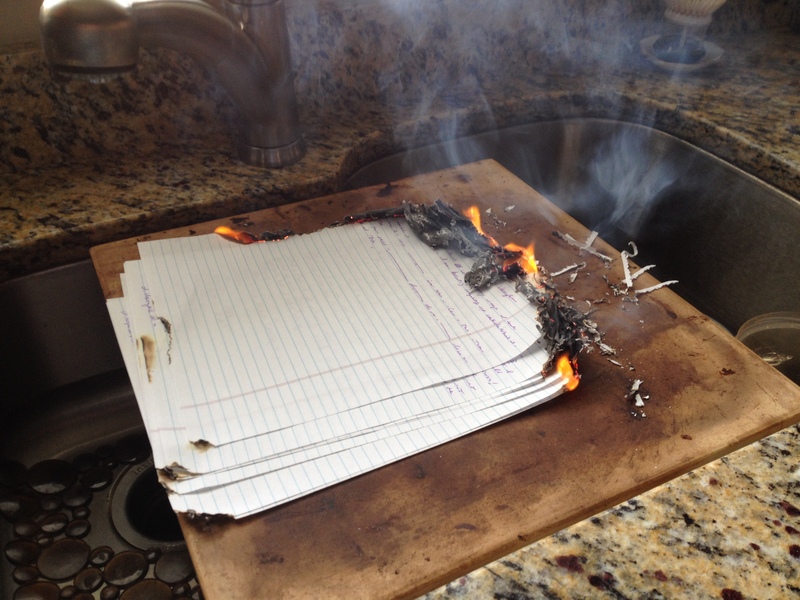 Burn a picture or a poem or special card. It works for humiliating situations, maybe fired from a job, maybe held up to ridicule or judgement for one thing or another. The incident doesn’t matter, what matters is that it is over except in your head. Get it out and on paper and then burn that sucker down. The charred remains will satisfy you in an inexplicable way. Just make sure to douse the fire and maybe even soak the ashes and bits of stray paper before tossing them in the trash where they belong. Be safe, be happy, be renewed. Balance your books and forgive yourself. Of course I’m saying all of this to myself as well. Namaste. Jeri, it works! First time I did it was at a women’s retreat with Marianne Williamson. 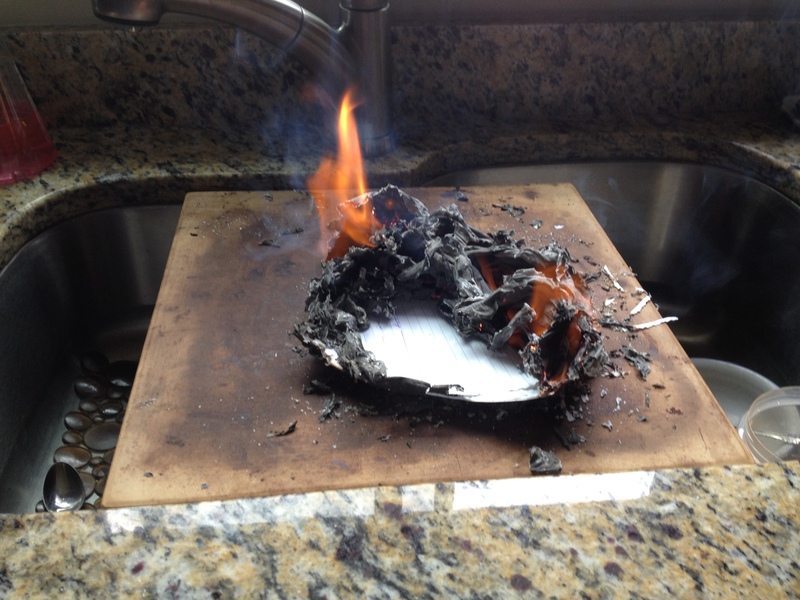 We wrote down our regrets and fed them to a huge fire in a burning bowl. It was awesome. Wow, for some reason lately, unknown to me, I have been thinking about all the bad, embarrassing, hurtful things I have ever done in my life, including all the stupid things I have ever said. I have been thinking about the mistakes I had made in the workplace and with family and friends. It is hard to be an elf to myself and let it go although I know I need to let it go and be in the present. Knowing you have had the same feelings is a little reassuring to me. Knowing I am not alone helps ease my unease. Must be something about being in, over, or at sixty years of age–kind of like a flashback of your life during a final moment, I dare to guess. Thanks for sharing. Marie, I was thinking the same, that this has been a kind of “taking stock” thing, having to do with age (I’m turning 60 soon and it has been much on my mind) where I wonder if I did all I meant to do, what I still need and want to do, if I did more harm than good and all of that. I think it might be normal, and I think the people who have regrets and admit are halfway to letting go. Good luck! Jenanita, I do not want my kids to see all my private musings, lol. Might scar them for life. I wrote several hundred journal pages over the last six months on the computer. That was easier to get rid of, just trash/delete:) But the fire was fun as strange as it sounds. I do like keeping paper journals, so usually I just throw a few away at a time as I clean out my bookshelves. They mostly bore me to tears, so I don’t bother burning them, but the regrets pages, oh yes, those needed to burn! something very therapeutic and fascinatimg about watching the flames destroying what needed to go, but, I suspect very dangerous. Perhaps it’s how arsonists are made! This is such an amazingly simple (yet brilliant idea). I too am full of regrets – things that waft around in my brain from time to time haunting me, letting me know that I’ve done wrong and they’re there to remind me. Those little suckers don’t let go. So maybe I should. Great post, well written. Fabulous! Thank you so much, Sally. And a few days later, I can say the cleanse worked like a charm. I did one more thing–I trashed every single journal entry from the last six months. I’d been keeping a private journal on my Mac, and the pages added up alarmingly. I skimmed those private diaries and saw the messy direction my life had taken and was so relieved to be on the other side of all that turmoil. So I dragged the diaries to the trash and in they went. One last step: I emptied the trash. Regrets gone for good! And that part was much easier than setting a fire in my kitchen. Glad I did both though. Sometimes a ritual with something elemental like fire or water really does the trick. Good luck to you with ridding yourself of your own regrets, however you plan to do it. Just thinking about it is the first step! Thanks Jan, I wouldn’t know how to not be a writer, lol. I’m doing so much better now–thanks for your concern. Means a lot! And Jan, You look great at 64! I plan on having the best decade of my life in my 60s! You’re welcome. I hope it helps you!